The Brisbane area is surrounded by great islands. 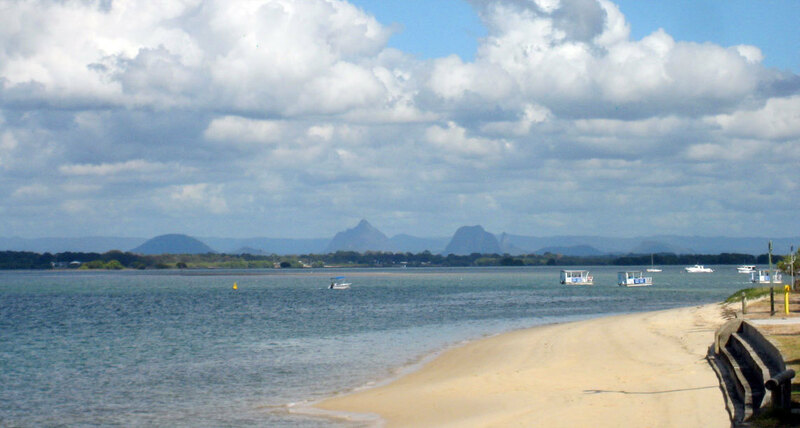 Bribie Island is the most accessible because it is connected to the mainland by a bridge. Most of the island is national park. One one side is quiet family friendly waters Pumicestone Passage suitable for a range of water based activities. Elsewhere are wide white sandy beaches suitable for walking, 4 wheel driving and swimming. This is a fantastic island to visit with a little something for everyone. 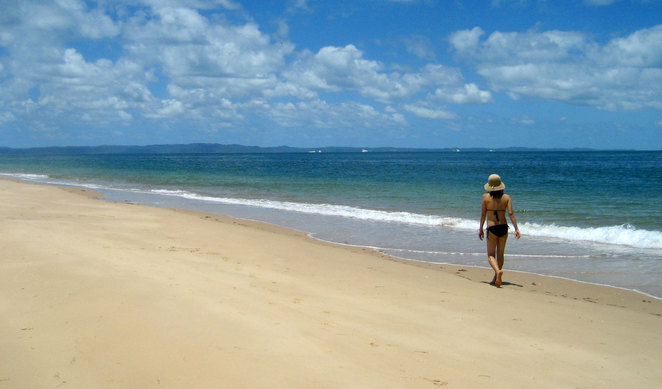 Bribie in fact compares favourably against islands like North Stradbroke and Moreton Island. Some people I know have told me that they found Bribie Island a little boring, but that really was because they didn't know where to go. The seaward side of Bribie Island is pretty much all beach. There are 2 main choices for swimming. 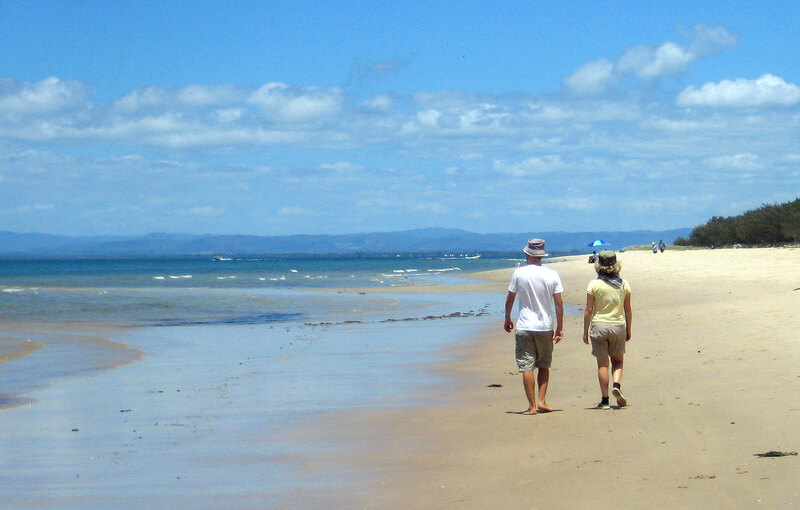 Woorim has a nice patrolled beach that faces out to Moreton Island. You will also see many people head further down the beach for a more private spot. The other swimming location that is better for young families and less confident swimmers are the sheltered waters of Pumicestone Passage at Bongaree. You can also head to the quiet Red Beach that makes up the southern end of the island. You can walk from Bongaree or Woorim or drive the high quality dirt paths to various beach access points. This beach is completely leash free for dogs and a great place to relax. However the water is generally pretty shallow out for a long way and doesn't make for a great swimming beach. The northern seaward side of the island is all only long wide beautiful beach. Most of this is only accessible by walking from Woorim, following various 4WD paths or driving on the beach itself (you will need a permit to do this). The section of the beach is subject to waves and rips, so swim at your own risk. 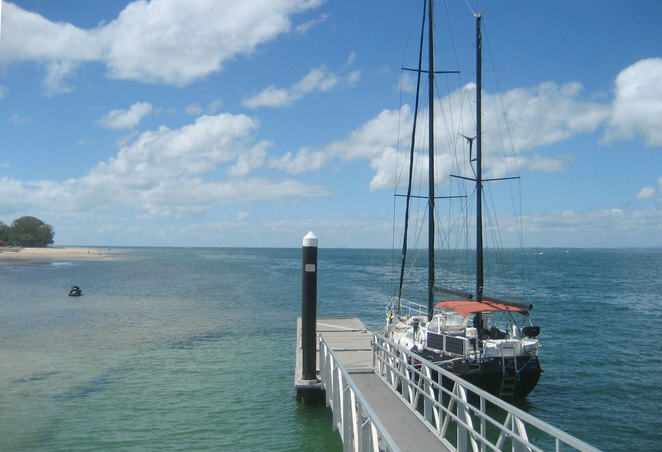 Being on Pumicestone Passage means that it is the perfect place for water sports. You can rent boats, kayaks and stand up paddle boards at several places at Bongaree. 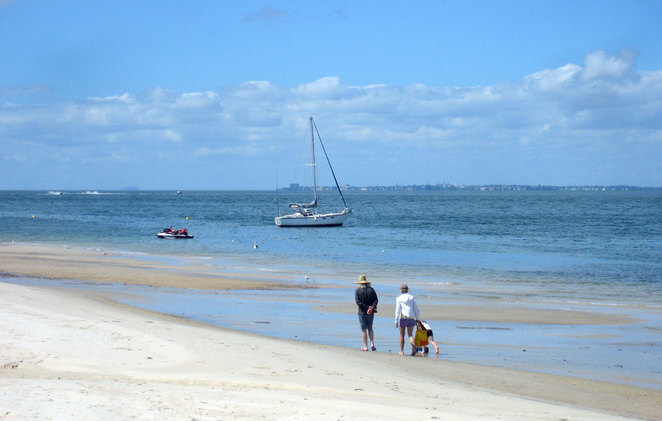 Hiring a boat and heading up the calm waters of Pumicestone Passage is a popular option. While you can just cruise and enjoy the natural environment, Pumicestone Passage is also a popular place for fishing. One popular option are barbecue boats which, as the name says, are a barbecue on a boat. Perfect for parties on the water. Kayaking around the passage is also fun. Experienced kayaks can head far up the passage, especially if the tide is flowing the right way to help you, however most people will enjoy a couple of hours of paddling around Bongaree. If you do boat up the passage, there are several places you can stop off at, such as Poverty Creek Camping area. Overall Pumicestone Passage is a nice place to explore. Despite the fact that most of the island is national park, it is not exactly a hikers paradise. But there are a number of lovely walks that you can do. The mostly popular place is on the waterfront at Bongaree and Banksia Beach. There are about 4 kms of lovely parkland with exercise equipment and barbecues. The best option is to start up in Banksia Beach near the Sylvan Seafood Cafe and walk south ending at the Seaside Museum (don't forget to pop into Scoopy's for some ice cream) and then head back again. For serious walkers, the best walk to do is Red Beach. Ideally you start at Bongaree Jetty where there is plenty of parking and walking south around the southern end of the island for 8 km until you reach Woorim Beach (when you see the surf life saving flags you know you have reached the end of the walk). Even at high tide you can do this walk without getting your feet wet, but where is the fun in that. It is much better to take off your shoes and paddle in the water. Though don't forget your shoes because, unless you take the bus back to Bongaree, you need to walk 5 kms back on the bush lined paths. There are also the little Bribie Island Bicenennial Trials off Sunderland Drive. However we are only talking about a couple of kilometres return. Another area worth wandering around is Buckley's Hole Conservation Park just south of Bongaree. This little wetland area is home to numerous wetlands birds, especially during the summer migration. 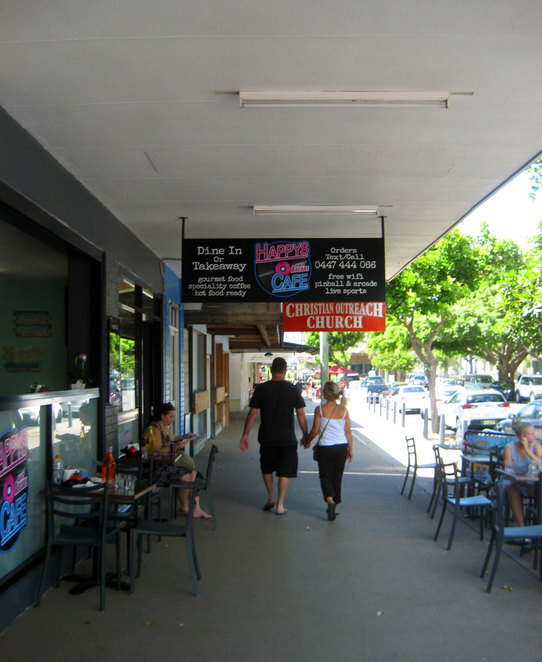 Bribie Island has a wide range of options for dining. The main areas to head to are Bongaree and Woorim, which each have their own little seaside villages. For more mainstream and chain restaurants and takeaway places there is the main shopping district at the norther end of Goodwin Drive. 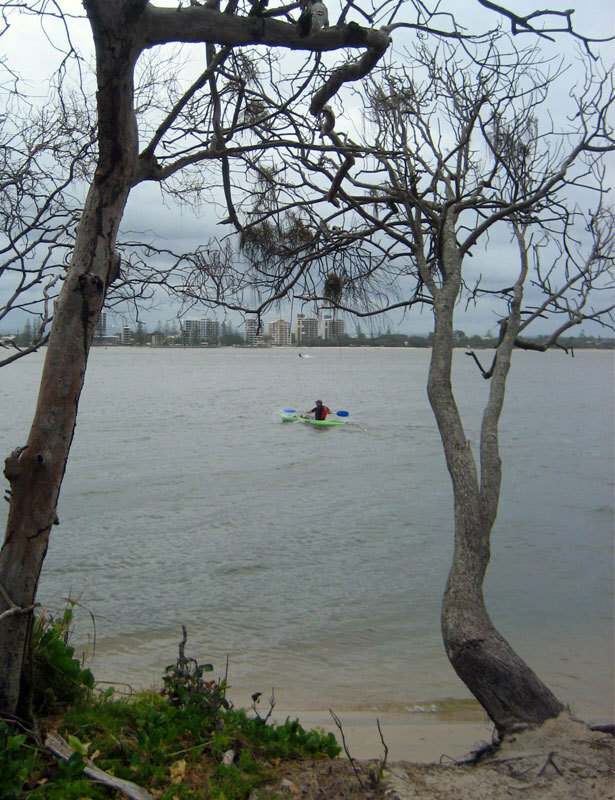 In addition there are a few isolated places in Banksia Beach and across the bridge at Sandstone Point. One of the most famous places to eat on Bribie Island is Scoopy's Ice Creamery & Sidewalk Cafe near the Bongaree Jetty. Basically a fish & chip shop with cheap ice cream cones. This is the perfect spot for a family lunch. Also in Bongaree is Merlots By the Sea Wine & Tapas Bar. This restaurant has great meals, tapas with generous servings, wonderful desserts as well as drinks and entertainment. Woorim has the Surf Club with good food typical of surf life saving clubs and great views of the ocean. Another great place to eat in Woorim is the Slice of Heaven Cafe which is also close to the beach at Woorim. This place is most famous for their breakfasts, but they also serve nice meals and desserts. 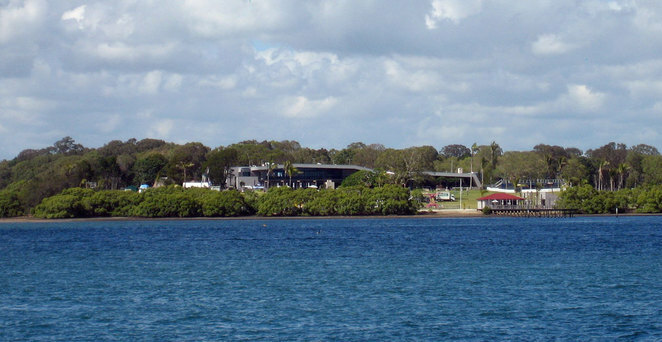 Across Pumicestone Passage at Sandstone Point is the Sandstone Point Hotel. 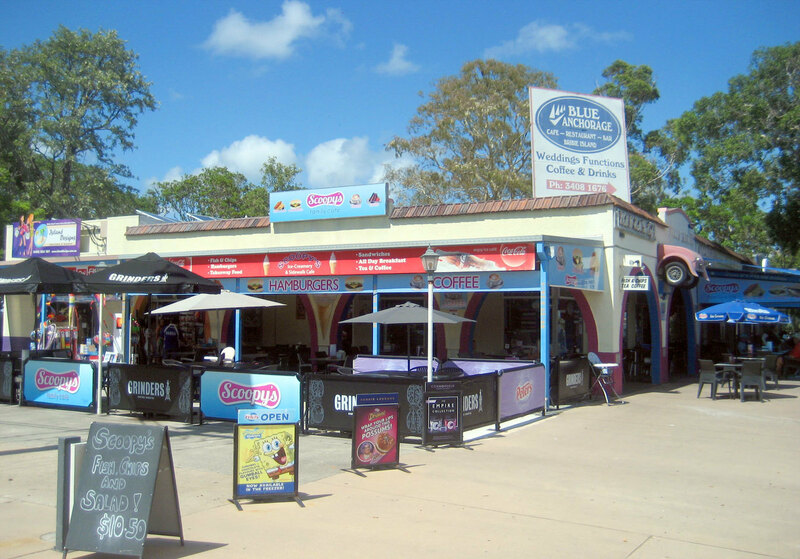 This wonderful pub is set on beautiful area of land overlooking Bribie Island. The food is great with options like pizza and burgers for the kids and delicious seafood meals for the more sophisticated diner. Don't forget there is also The Oyster Shed further down the grounds on the water edge if you want takeaway style meals. 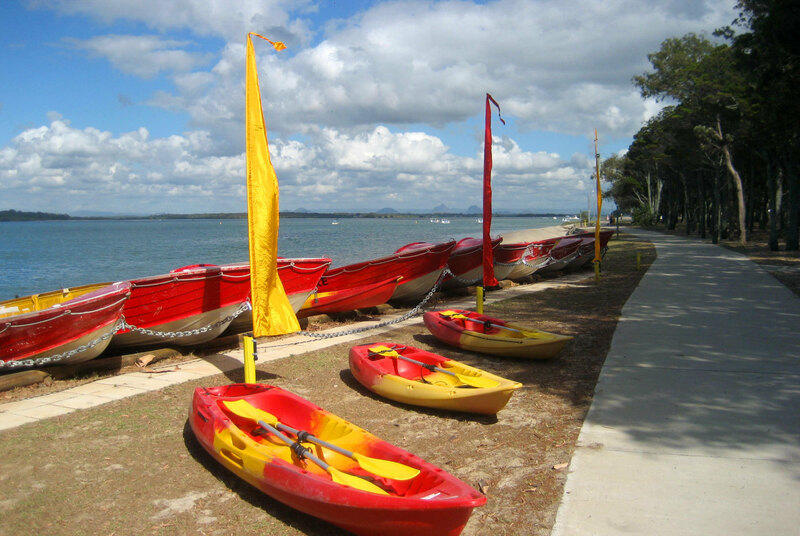 Bribie does have a few additional attractions along with the beach and water. The Bribie Island Seaside Museum is worth looking in on and is a nice place to take the kids. 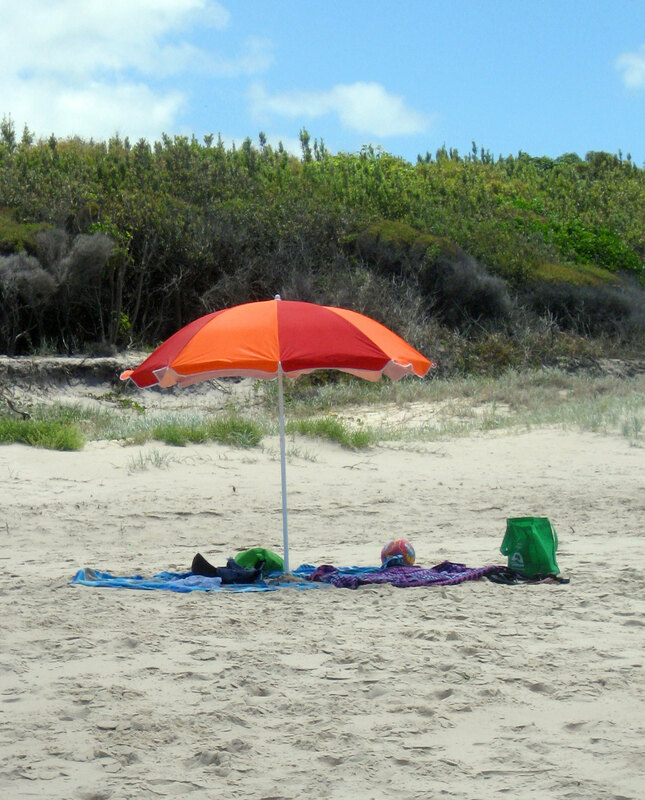 Bribie Island is also home to numerous artists. 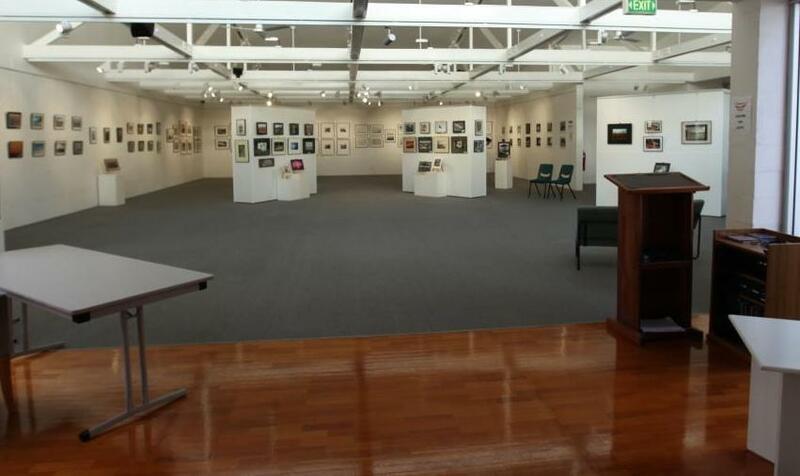 The Bribie Island Community Arts Centre is where local artists display their work. The Pier View Gallery in Bongaree (opposite the jetty) has a wide selection of local and regional artists. There are also markets every Saturday morning until midday at Pacific Harbour. The Sunday markets vary, with the Jetty Markets on every third Sunday at Brennan Park, Bongaree, The Rotary markets at the same location but every second Sunday and the Bribie Island Art and Craft Fair on every fourth Sunday from 8:30 am to 1:30 pm at the Bribie Island Community Art Centre. There are also three lawn bowls clubs, a golf course, a swimming pool and a small twin screen movie theatre. So there is always something else to do for people of all ages. While I see Bribie as a good day trip from either Brisbane or the sunshine coast, but it can easily be a great destination for a weekend or a long weekend escape. 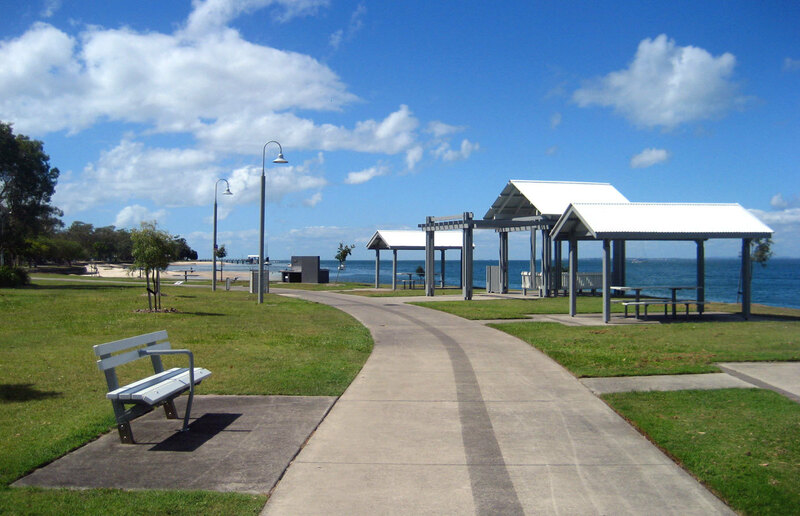 In fact, Bribie is a pretty cheap destination with a lot of hotels and hotels charging about $100 to $120 a night (depending on the day of the week and the season). The Fairways Golf & Beach Retreat is one of the better hotels. The Twin Flame Retreat has a heavy emphasis on health and well being with meditation and yoga as part of the package. For people looking for a cheaper get away, consider the caravan parks. There is one at Woorim and another at Bongaree. They provide cabins as well as powered sites. Camping is a good option. There are several camp sights. Poverty Creek and Ocean beach both have toilets and showers. These sites are accessible by camper trailers. There is also a bush camping site at Gallagher Point with no facilities (bring everything yourself). There are also two camp sites accessible only by boat. Mission Point has toilets and showers, while Lime Pocket is a bring your own bush camping area. To find out more about the campsites or book a campsite, then visit the National Parks Website. Driving of course is very easy, but so is public transportation. The 640 bus runs every hour during the day, 7 days a week from Caboulture to Woorim. This makes it easy to use public transportation for a day trip to the island. There are also buses that run across the island. The southern end of the island is very suburban so it is easy to drive around. The northern part is all national park and a 4WD is recommended for the sandy roads. If you apply for a beach permit you can also drive on some parts of the beach. Of course the cool people will arrive on Bribie by water. I quite enjoy kayaking across from Golden Beach in Coloundra to the northern tip of the island. The southern end of Pumicestone Passage is wider, but still only 1 km across from Sandstone Point. It is also possible to rent a range of sail and motorboats at both Sandstone Point and Golden Beach. You can take a little motorboat up the passage or even hire a barbecue boat and cruise the passage while cooking lunch and enjoying a few beers. Travelling by boat gives you access to various stop off and camping locations along Pumicestone Passage. Kayaking further up and down the passage is only recommended for people who are experienced and fit kayakers.